Premiered in 1892 as an unusual double-bill with the ballet The Nutcracker, Tchaikovsky’s Iolanta has been mostly forgotten outside of Russia for over a century. Recent years have seen several revivals, especially in Germany and recently in Paris and New York. Paris opted for the original pairing with The Nutcracker, and New York chose to present it with Bartók’s Bluebeard’s Castle. The small bilingual Swiss city Biel/Bienne has presented the short work as a stand-alone opera. Given the intensity of the opera, this might be the most sensible choice. Like other short one-act operas, such as Elektra, Salome, Pagliacci and Cavalleria rusticana, Tchaikovsky’s final opera, lasting just ninety minutes, is rendered more intense by its brevity and lack of interruption via intermission. The fairy tale is based on the once successful play Doch korolya Rene (King René’s Daughter) by Danish playwright Henrik Hertz. Iolanta is a princess, blind from birth, whose father King René of Provence shields from the truth of being blind and even of being a princess. She lives in a pavillon on the king’s estate without any contact with the outside world. King René receives in his court the Moorish doctor Ibn-Hakia who believes he may be able to cure the princess of her blindness, provided she is made aware of her condition. He believes that only a strong desire to see may make his treatment work. The princess is betrothed since childhood to Duke Robert of Burgundy, who has fallen in love with another and is not eager to marry Iolanta. He travels to Provence with friend, Count Vaudémont. Vaudémont finds Iolanta’s garden and is enchanted by the sight of the sleeping princess. Smitten by her beauty and fragility, Vaudémont discovers that she is blind and reveals it to her. Found together by the King, Vaudémont is threatened with execution for his revelation to Iolanta of her predicament. Now that she is aware of being blind and motivated by Vaudémont’s love, Ibn-Hakia accepts to treat her and she recovers her sight to marry Vaudémont and they live happily ever after. Stage director Dieter Kaegi chose to alter the happy ending. The princess is overwhelmed by all the stimulation she gets from the new sense of sight and blinds herself. This provocative ending, though controversial, was riveting. The paroxysm of Tchaikovsky’s excessively passionate music does not subside with the ending of the music. The tension is never resolved. The polite Swiss public did not protest and even warmly applauded the deserving singers and musicians. In a less serene place, a sizeable part of the public would have vehemently protested such liberty in staging. Indeed, the text dictates a happy ending and Iolanta’s final stanza, “Primi havalu raby smirennaj”, is an extolling of God’s grace for giving her sight and love. On the other hand, there is merit in Kaegi’s vision. 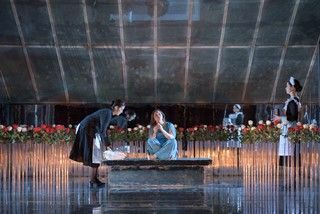 The King’s insistence on shielding Iolanta from the knowledge of her condition and from the world is excessive and even perverse. It can be seen as an irrational desire to keep her forever innocent. Her discovery of her blindness and of love as well as acquiring vision all in a single day is too much for anyone, especially for this innocent child-woman. Such a desire to escape from the plethora of stimuli is an understandable, though horrific, option. Violence and cruelty seem to fascinate Kaegi: Iolanta’s attendants had all been deliberately disfigured on the cheek so that blind Iolanta could recognize each from the shape of the scar. This is quite a gruesome but perhaps necessary innovation given the surprising end. The singers were ideally cast. All six main roles were sung by Russians or Russian speakers. Anna Gorbachyova has a creamy powerful voice with a wide range and well supported high notes. In her first scene arioso, “Otchego eto prezhde ne znala”, she convincingly conveys her sadness and feeling of something missing. Often sung by sopranos with a heavier voice, the role benefited from the casting of a lighter, higher voice, to suit the innocence of the character. Tenor Irakli Murjikneli was a dashing Vaudémont with a heroic voice and no difficulty in the upper register. The Iolanta-Vaudémont duet, “Vy mne predstali kak viden’ye”, was passionately and sensually sung. The chemistry between the two singers made the fairy tale characters seem real. Pavel Daniluk was an imposing King René. His deep bass appropriately conveyed his fatherly love and regal standing. His aria, “Gospod’ moy, yesli greshen ya”, was moving and his low notes impressive. Francis O’Connor’s posh sets and costumes were appealing. The action shifted from the Middle Ages of King René to the Belle Epoque, which is the period of the opera’s creation. The orchestra was amazingly good for such a small town. It put to shame orchestras of several major theatres. Francis Benichou had an obvious feel for Tchaikovsky’s music, bringing out the passion through his sense of tempi. He was also a singers’ conductor, never rushing or overwhelming them. It was a delight to be in Biel’s theatre, a tiny hall with a capacity of a couple of hundred spectators. It was amazing to hear serious opera with first rate singers and a full orchestra in such a small venue. This city, run by a Socialist-Green coalition, must have its priorities right. It is also the headquarters for the prestigious Rolex company and the more sporty Swatch watches as well. Perhaps prosperity helps!